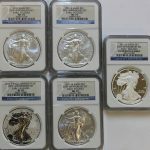 Issued in commemoration of 25 years of the US Silver Eagle 1 troy ounce program, 5 different finishes and mint marks were offered as a special set for collectors. All 5 coins carry the Early Release designatin by NGC with the 25th Anniversary label. 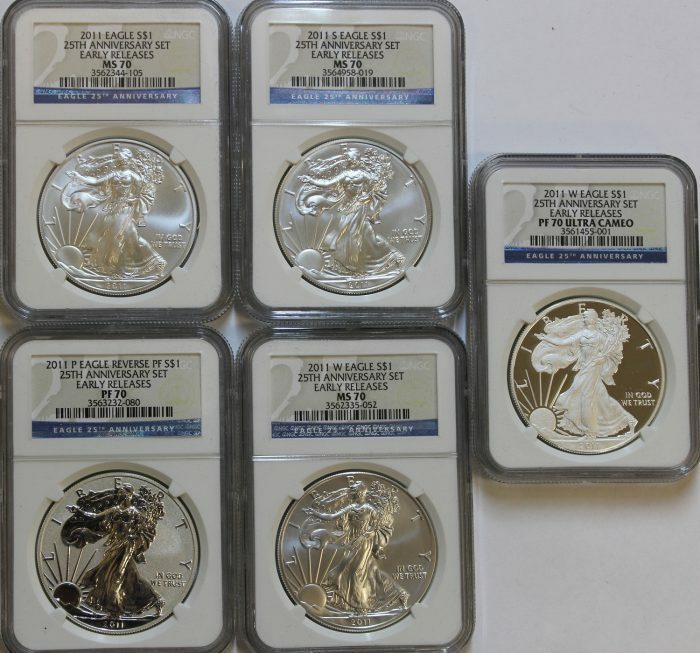 the Cert#’s are as follows, regular issue 3562344-105, P-mint reverse proof 3563232-080, S-mint regular finish 3564958-019, W-mint Proof 3561455-001, W-mint burnished uncirculated 3562335-052. Comes in a privately made custom display box.